Cinnamon essential oil has been a new favourite since discovering some of it’s really amazing uses. From an all-natural hand sanitiser to a DIY mouthwash, this versatile oil can do it all. Albeit, admittedly, the really good stuff can be a bit on the pricey side. My folks local herbalist in Spain for example sells a 10ml 100% Cinnamon Bark essential oil for 18€ (about £15.40). If you wanted to opt for a Cinnamon Leaf essential oil instead, it will likely be cheaper. Like this 10ml bottle sold at Holland & Barrett for £6.25. Both are good options, and contain cinnamaldehyde and eugenol as their main constituents. Cinnamaldehyde is what gives cinnamon it’s trademark scent, as well as it’s antiviral and antimicrobial properties. 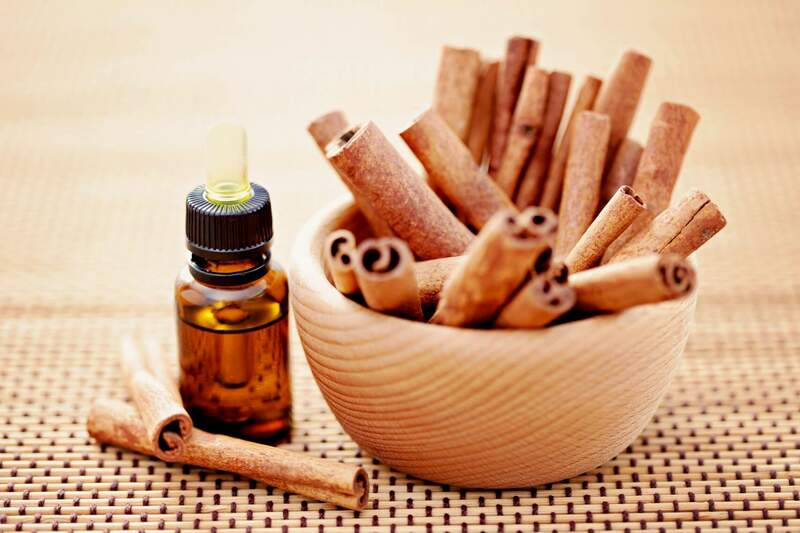 Eugenol is also responsible for the cinnamon-y scent, and is valued for it’s analgesic qualities. The leaf oil has higher levels of eugenol, and the bark oil has higher levels of cinnamaldehyde. The noticeable difference however, is simply that the bark oil has a slightly spicier, sweeter and overall stronger scent and taste than the leaf oil. The leaf oil is also lighter in colour. If you’re not sure which one is best for you, we recommend trying recipes with both oils and seeing which you prefer. So far, we’ve become obsessed with the bark oil, as we love the strong perfumed scent, antimicrobial effects and powerful kick it gives to our homemade mouthwash. As well as the fantastic topical uses and functions, it’s also proven to support a healthy immune system, decreasing inflammation, increasing circulation, relieving depression, stimulating libido, and has even been used for it’s ability to fight off parasites and repel insects. Cinnamon, and it’s oil is also packed full of antioxidants, making it a powerful protectant against free radicals. Cinnamon oil comes from the Cinnamomum tree, which is a genus of evergreen aromatic trees and shrubs containing over 300 species and belonging to the laurel family. They can be found in tropical and subtropical regions of North America, Central America, South America, Asia, Oceania, and Australasia. The most common tree used by herbalists to make essential oils is the Cinnamomum verum, also known as “true cinnamon” (once called Cinnamomum zeylanicum). When buying any essential oil, pay close attention to the labelling and instructions. The price will also indicate the purity of the product, so if it’s too cheap, be very skeptical. If you’re buying online, be sure to check more than one seller to compare pricing and see more customer reviews. We recommend visiting a distinguished herbalist for your first ever purchase. This way you can talk about all the benefits, effects and uses with the store assistant/shop owner and they can get to know your personal needs a little better. It will also ensure you are getting a proper essential oil which you can hold as a comparison for any future purchases elsewhere. Reach for nature’s greatest gift with our Aromatherapy Course spanning 12 lessons. Discover the properties of essential oils and their contra-indications, learn how to use them in a treatment session with massage techniques and benefit from therapeutic oil recipes. Our courses carry internationally-recognised diplomas that entitle you to practice as a therapist anywhere in the world. Our school has a no stress, no commute, no deadlines, and no fuss policy! Just affordable, holistic education right at your fingertips. Enrol with us today to take advantage of our April offers and take a step towards a brighter future.